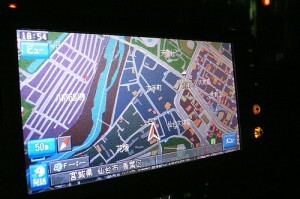 The number of automotive navigation system users is 65% of the all car owners in Japan. It is called “car navi” and it’s been infiltrated in our life. The familiarized features so far are, music player, TV, internet, CD and DVD, touchscreen, 3D display, considering traffic jam search, short cut search, route learning, audio and picture guidance of restaurants and businesses around the area, and so on. Some car navi have selectable dialect option, which the guide talks in casual way with humor, so it could be a good company for a long drive.